Orange Pi Zero boards series are sold in various SoC configurations, where the H5 is the newer one with the same board dimensions and layout as previous H2+ and H3 boards. The new Pi Zero Plus 2 H5 Board features the latest quad core Cortex A53 64-bit processor with faster processing capabilities, also improved high performance Mali-450MP4 GPU, compared to previous boards that were equipped with the less advanced Mali-400MP2 which only had two shader cores. This board also features On board WiFi + BT AP6212 chip, 8GB On board eMMC Storage as well as 512MB DDR3 SDRAM ,IPEX socket, UART debug interface, CSI, 26 PIN header, Micro SD Card slot and additional 13 pin interface that can be used to gain more functions. Important to mention that the Orange Pi Zero Plus2 H5 isn’t include in the Kit, therefore you need to buy one separately or alternatively pick a suitable kit available in Orange Pi Store. That said, the package contains a compact plastic cube shaped case, available in white / black colors and an expansion add-on board that fits inside the case that connects directly to the zero plus2 13 pin header, and provides two USB 2.0 Hosts, IR Sensor, On board microphone and Analog composite video port. Connectivity – 802.11 b/g/n WiFi + Bluetooth 4.0 LE (Ampak AP6212) with u.FL antenna connector and external antenna. The Kit came with a high quality plastic case, 6 screws, Small round shape rubber stickers, simple wire type WiFi Antenna, Orange Pi Zero Plus2 H5, and the Zero Board Expansion Card. If you want to use the 26 header pin interface, you would most like need to buy on and solder it to the board. That said, from first impression all items were of high quality and well packed. 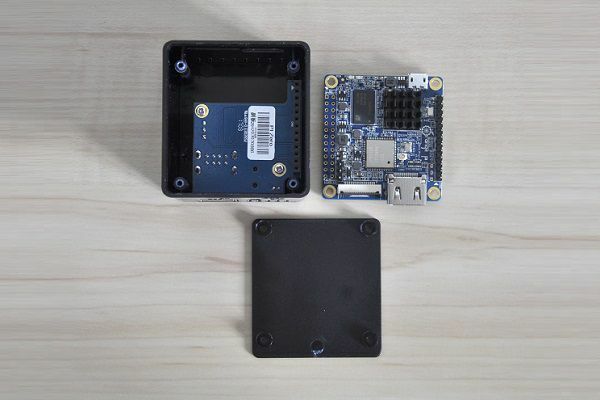 The Pi Zero Plus2 dimensions are small and compact, measuring 48 x 46 mm making this device very portable and easy to carry. Also, its compact design makes it an idealistic choice for DIY projects. For example, building an open source based IP Camera, NAS or a Mini streaming player with decent hardware specifications. If you’re planning on using it as a mini PC it also works reasonably well with 512MB RAM, but don’t expect it to be powerful as high-end single board computer boards sold in higher price tag. In terms of graphics and video performance, This board should perform much better compared to previous Orange Pi Zero H2+ and H3 SoC 32 bit boards, where H5 is a 64 Bit SoC with a newer Mali450 MP4 GPU equipped with a total of four cores. By default, the board comes with few interfaces, including the HDMI port. If additional interfaces are needed such as the microphone, IR receiver, earphone and analog video/audio port you can solder/connect wires directly to a 13 pin header, or alternatively buy the Zero board expansion card which makes life much easier and simple without a need for extra wiring. Heatsinks and thermal pads are not included in this package, so you will need to buy them separately. The one that would fit the H5 Chip dimensions measures: 14 x 14x 7 mm. If you are planning on buying a higher heatsink more than 7 mm , keep in mind that the expansion card is positioned right above the H5 chip, therefore there is a height limitation and choosing a higher type can “touch’ the board and may cause a short circuit. Not a “must have” accessory to buy. For those who like to save a few extra dollars and spend some time in designing and building a case, it’s also an option. This ABS plastic case is specifically designed for the Orange Pi Zero Plus/2 and expansion boards assembled together. If you are not planning on buying the expansion card, it can’t be used. That said, based on my personal impression. Both quality and design of the case where good with venting slots located on the front and rear along with all the external interfaces of both boards. A simple wire type WiFi antenna connected by default to the board Ipex Socket is included with the board. When both boards were assembled inside the case without it, the WiFi single was weak. For some reason, Xunlong company forgot to add a hole in the case to pass the wire through. In this case, the solution was to heat a screwdriver and melt the plastic until a 3-5 mm hole was formed. Once the antenna wire was connected to the board everything worked well and the WiFi signal reception improved. The Orange Pi Zero Plus2 H5 supports five types of OS images: Debian, Ubuntu, Android 5.1, ArchLinux and Armbianֹ Ubuntu (Dev Build). From my general impression running and playing with most of them, they worked well. Android 5.1 OS image was missing Google Play store and worked much slower compared to the Linux distributions. This is because of the low 512MB RAM limitation that is basically is lower than required by google to run a smooth and stable system. Worked pretty well. Sound and network settings were properly configured without issues. Although the CPU maximum frequency is 1.5GHz with Debian Jessie it was clocked to 1GHz. From a total of 512MB of RAM system, I was left with about ~37M of free memory. With limited physical memory available a swap partition will be needed, at this point, a minimum of 1GB should have been a better pick, but again this board is not intended to be a high-end hardware, just a good alternative to the raspberry pi zero in terms of hardware specifications so it’s understandable. In a normal operation mode without over loading system resources under Debian Jessie OS, the CPU temperature measured between 40-50C. In standard operation mode, without overload system resources and CPU both boards consume 4.2-4.4W. After stressing the CPU to the max for 60 seconds using stress tool power consumption raised to 5.4W measuring temperature of 57C. Based on personal experience playing with the product, it works reasonably well and stable, except the Android OS Image that performed very slow. I doubt users will use it as an android mini PC with such low physical memory. The 8GB eMMC and additional external interfaces are a definitely a big advantage, my experience with the Linux images was good and I recommend buying and using this kit mainly for “light” open source DIY projects that don’t consume much memory or CPU power.